Offered only in the diesel avatar, the Zest Premio gets 13 new cosmetic add-ons. To commemorate the sale of 85,000 units of the Zest, Tata Motors has launched a special edition of its compact sedan, the Zest, called the Zest Premio, at Rs 7.53 lakh (ex-showroom Delhi). It’s only offered in the diesel guise and sits below the XT variant, priced at Rs 7.88 lakh and over the XMS variant, priced at Rs 7.28 lakh (all prices ex-showroom Delhi). In addition to the features offered on the XMS variant, the Zest Premio gets a Harman-powered touchscreen infotainment unit with phone-based navigation (XMS gets a button-enabled unit). Cosmetic add-ons include piano black finish on ORVMs and hood strip at the front, glossy black roof, smoked multi-reflector headlamps and piano black boot lid garnish. 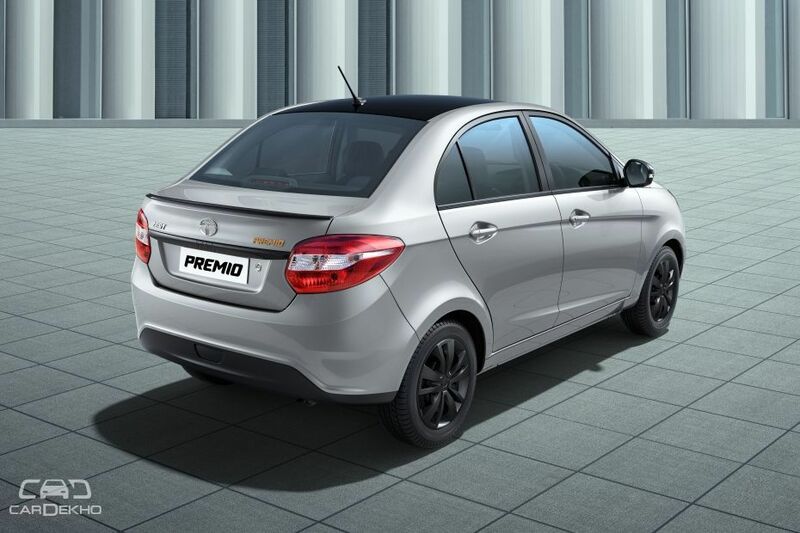 The Premio also gets silver wheel covers, optional piano black spoiler and a ‘Premio’ badge at the rear. To give the special edition its distinct identity, Tata is offering it in two new exterior colours – grey and silver. Inside, the compact sedan gets a dual-tone dashboard with tan finish in the middle. A new seat fabric with contrast stitching and ‘Premio’ branding make the cabin feel a tad fresher. The Zest Premio costs Rs 25,000 more than the Zest XMS and all of that goes into enhancing its appeal. Buyers who like their cars to stand out can go for the Zest Premio. If standing out of the crowd isn’t what you’re looking for, the XMS variant offers almost the same equipment as the special edition. As mentioned before, the special edition comes with only a single engine option – 1.3-litre, Quadrajet turbo-diesel engine. Mated to a 5-speed manual transmission, it pumps out max power of 75PS and 190Nm of peak torque. Automated manual transmission (AMT) is not offered with the Premio variant, while it’s on offer on the XM and the XT variants of the Zest. The sales of the Tata Zest have seen a consistent drop in the past months. 12,695 units of the sub-compact sedan were sold in the first half of 2017, while it could only manage 9,853 units in the second half. The Premio special edition, then, could be an effort to attract more buyers. Tata showcased what it can do on its latest AMP platform with the 45X concept at the Auto Expo 2018. And we cannot wait to see a sub-compact or a compact sedan, based on the premium hatchback concept, replacing the ageing Zest. Recommended: Clash of Segments: Renault Kwid 1.0L vs Tata Tiago – Which Car To Buy?